First look at two all new colorways of the Nike SB P-Rod 2.5. After recently giving you a look at some of this month's Nike SB Footwear line, we're hit with brand new shots of the aforementioned Vulc-Rod and two new colorways of the P-Rod 2.5. Included in this latest preview is the much talked about aqua-based SB P-Rod 2.5, which has been rumored to be a part of the upcoming Diamond x Nike SB collaboration. Easily the nicest colorway in the pack, we cannot confirm that they are an official Diamond x Nike SB collaboration. 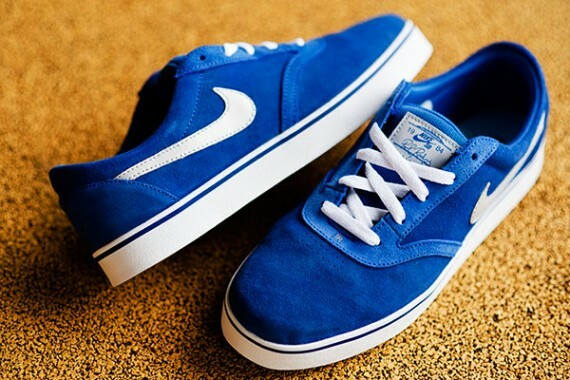 Also seen is a white and royal blue make up of the P-Rod 2.5, which arrives ready to be skated in an all suede look. We also get a look at the previously previewed Vulc-Rod, releasing in royal and black based colorways. Look for these new colorways of the Nike SB P-Rod 2.5 and Vulc-Rod to arrive at your local Nike SB retailers soon.